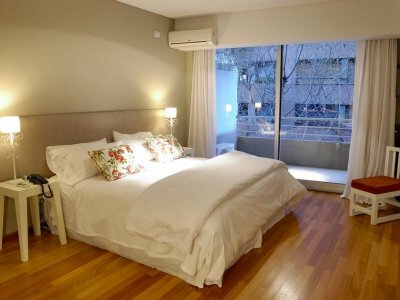 Apartment in Buenos Aires, Palermo: Segui St. & Sinclair St.
Modern studio apartment located in the popular neighborhood of Palermo, one of the most desired places to live in the city. The neighborhood is characterized by tree-lined streets, traditional and modern cafes and restaurants, some of the best shopping boutiques, and plenty of transportation lines. Guests will also be able to take advantage of the weekend markets, excellent bar scene, and both local and international art galleries and museums. 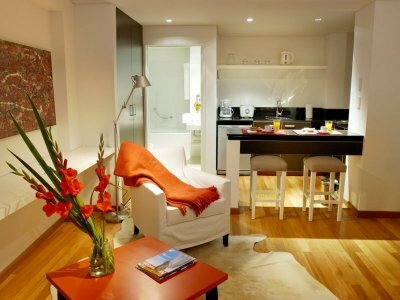 Stylish furnishings describe the atmosphere in this beautiful unit located on the fifth floor. 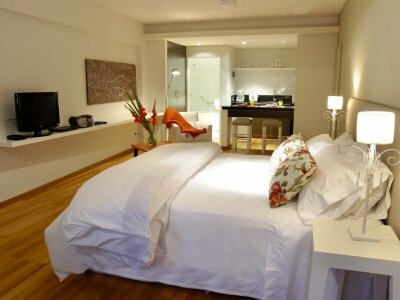 The living space features a queen-size bed, LCD TV and armchair, with a gorgeous view of the balcony and trees outside. The open kitchen features a bar with two bars chairs where guests can dine. 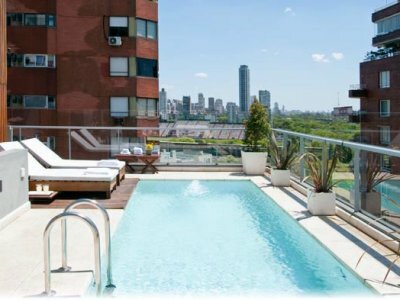 This urban modern building offers a nice terrace with outdoor swimming pool. -LIVING AREA: Bright and spacious living space, illuminated by high windows, and decorated with a armchair, 32'' LCD television, and queen-size bed. Hardwood floors throughout. 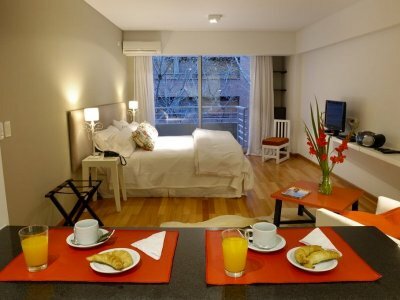 Includes: air-conditioning, Cable TV, DVD player, Wi-Fi internet, plus access to the balcony. -BALCONY: The balcony brings in plenty of light to the living room. 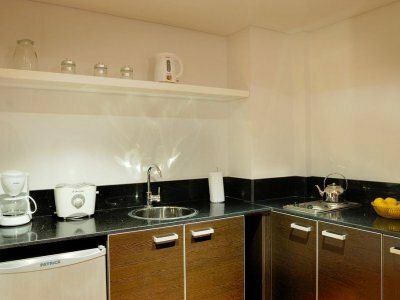 -KITCHEN: The open kitchen is fully equipped with a small fridge undercounter (no freezer), electric toaster, electric coffee maker, blender, microwave, electric two-burner stove and complete tableware. 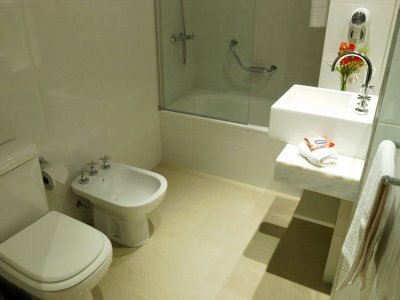 -BATHROOM: A modern and fully furnished bathroom with both bathtub and shower. Includes hair dryer. 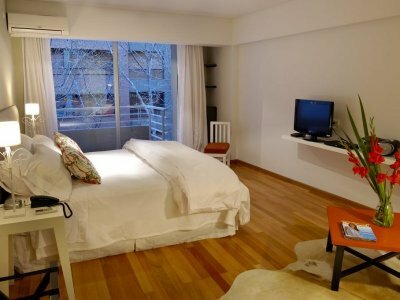 If you are visiting Buenos Aires with family or friends we have more apartments within the same building. 5-night minimum stay required to book this unit. These rates are final in USD; they include: building expenses, cable TV, electricity, water, gas, high-speed internet access, cleaning service once a week and taxes. 5-night minimum stay required to book this unit. Please note: Rates from December 20th to January 5th are higher for this apartment.